Government spending to expand the existing infrastructures combined with new projects and budding utility projects in countries such as Qatar, Saudi Arabia and UAE have resulted in the demand for construction equipment in the GCC region. Additionally, investments in utility sector has driven the demand for new construction equipment in the recent years. According to 6Wresearch, the GCC construction equipment market is anticipated to grow at a CAGR of 1.6% from 2016 to 2022. During 2015-17, the market for construction equipment is expected remain affected due to lower government spending due to declining oil revenues. However, post 2017, market would register improvement due to expected recovery of oil prices and initiatives taken by the various governments to diversify the economies. Amongst all construction equipment segments, earthmoving equipment segment held majority revenue share followed by mobile crane and dump truck. Earthmoving equipment are largely deployed across construction as well as mining sectors. In overall GCC construction equipment market, Saudi Arabia held highest revenue share, however, the market growth is exhibited to remain sluggish. On the contrary, countries such as UAE and Qatar are expected to register growth on account of upcoming World Expo in Dubai 2020 and FIFA World Cup in Qatar in 2022. The report thoroughly covers the market by construction equipment types, by applications and by regions. The report provides unbiased and detailed analysis of the on-going trends, opportunities/ high growth areas, market drivers, which would help stakeholders to device and align market strategies according to current and future market dynamics. 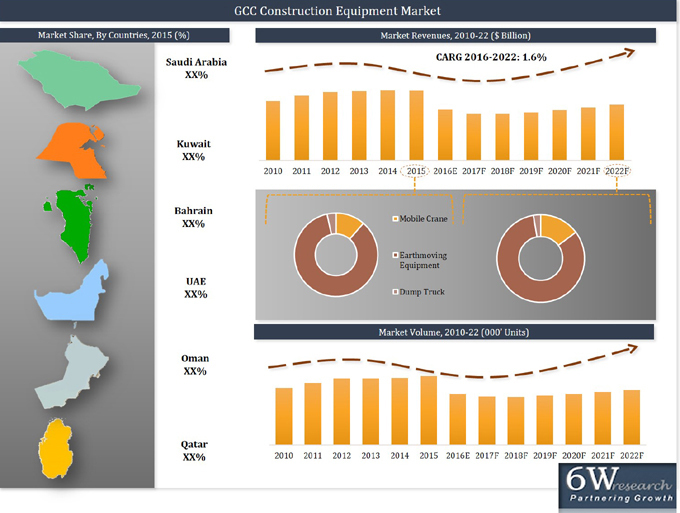 • Historical data & Forecast of GCC Construction Equipment Market Revenue & Volume for the Period 2010-2022. Applications & Regions for the period 2010-2022. 54.4	Hitachi Construction Machinery Co., Ltd.